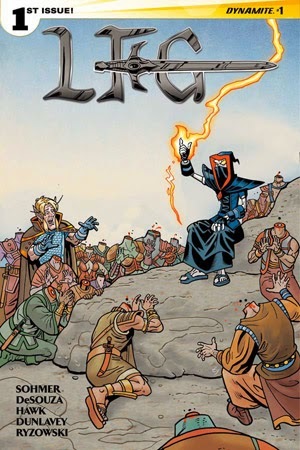 The Fellowship was fortunate enough to obtain a copy of LOOKING FOR GROUP #1 from Dynamite Entertainment and Blind Ferret Entertainment. Ryan Sohmer writes, Lar DeSouza draws and Ed Ryzowski colors. Cale is a young warrior looking for adventure and in need of noble companions to travel and quest with him. Unfortunately, who he finds is Richard, who bears many titles along with a penchant for doing not-nice things to anyone he encounters. Soon they need to find a healer, and that’s how they meet Benny. Benny has a quest for them, and so the adventures begin! This book is, simply put, freakin’ hilarious. Those of you who are familiar with the webcomic already know that, of course. But in this issue, they grab hold of the concept of evil as a different point of view and run with it to very funny effect (Richard’s reaction to the Sword of Truth is only one great example of what I mean). The creators are very familiar with the fantasy genre (fiction and gaming, it seems) and obviously love having fun with it. I haven’t laughed out loud at a book this much in quite a while. You should pick it up too. LOOKING FOR GROUP #1 is available now at your FLCS or at dynamite.com.